How can I view attribute columns in the Gantt? You can show additional columns with your card information on the left hand side of the Gantt chart. Additional columns can be shown by clicking +/- in the Gantt or by setting it in the filter & settings options. In the figure above the progress, actual start and end date, effort, trafficlight and assigned members are shown as extra columns. Additional columns will be saved in a bookmark when you create a bookmark in Placker. You can select the attribute columns you want to show from the filter & settings menu, the options are available under 'Gantt chart attribute columns', see the picture below. Here you can select the attributes you want to view as extra columns in the gantt. 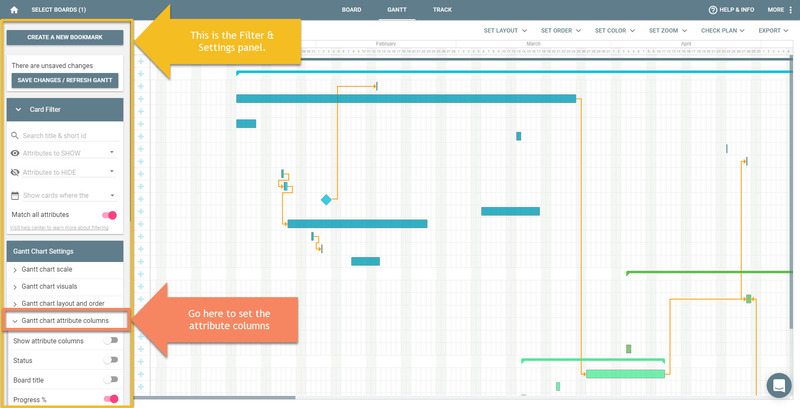 You need to save the changes after the update, otherwise the changes are not shown on the Gantt. Setting the attributes is shown in the screen recording below.